I've said it before, and I'll say it again, and I'll keep on saying it until I die an ignominious death due to high cholesterol and compulsive ramen consumption: Every kitchen needs an instant-read thermometer. I've said it so many times to anyone who will listen that even my friends accuse me of being on the payroll of the thermometer lobby. And yes, while we here at Serious Eats heartily recommend instant-read thermometers produced by ThermoWorks, like the ThermoPop and the Thermapen, with some regularity (and we do make some affiliate revenue on any purchases made through our site of said thermometers), all we really care about is that you have a reliable instant-read thermometer in your kitchen drawer (we even recommend devices put out by ThermoWorks's competition, if that helps. It should!). Why? Why is it so important to us that you have an instant-read thermometer? A good kitchen thermometer is essential for monitoring the temperature of whatever you’re cooking, which means that it needs to be both accurate and fast—sometimes all it takes is a degree or two before your custard curdles or your fancy shrimp go from tender to rubbery. While so-called "instant-read" thermometers don't give you an instantaneous reading, our recommended models display an accurate temperature in five seconds or under, and our top recommended thermometer, the aforementioned Thermapen, delivers the goods in under three seconds. Whether it's cooking a hunk of beef flesh for 10 minutes per pound, poking a chicken leg when they think it's done to see if the juice run clear, or pushing a pork loin to test its give, people use all kinds of tricks to cook big hunks of meat. I used to think I could push on a pork tenderloin and see a reading of 130°F in my head, even though I only cooked a pork tenderloin about once a month. Then I'd slice in and discover just how wrong I was. Maybe, unlike me, you're some kind of meat-temperature savant; if you're not, the the only way guarantee that your meat will be moist, tender, and cooked to a safe temperature is with a quick and accurate instant-read or probe thermometer. Oh, and no, probing your meat won't let all the juices out. For relatively smaller cuts of meat like chicken breasts, pork chops, salmon fillets, and steaks, an instant-read thermometer is also indispensable. That's because common tricks like pressing on your steak with a finger to assess its internal temperature are notoriously unreliable, while overcooking your food to ensure it's cooked to a safe internal temperature isn't exactly an appealing alternative. Again, I'm speaking from experience here: I used to grill my chicken breasts until they were dry as chalk on the inside (lol, who am I kidding, I live in NYC so ergo I don't own a grill—I was pan-roasting them to a chalky doneness). I used to think pork chops required a pan sauce, since there was no way anyone would want to eat a bundle of pork fibers plain. Short of going the sous vide route, using an instant-read thermometer is the only way you're ever going to safely eat a moist and tender chicken breast, or enjoy steaks cooked to your preferred doneness every single time, or bite into a perfectly cooked medium-rare pork chop. Once you move away from live fires and large meats and other culinary pursuits that the rabble often speak of as manly, you enter the territory of precision cooking that is especially easy to mess up. Case in point, poaching. We have devised a method to ensure perfectly cooked shrimp—start the raw shrimp in cold water and gradually raise the water temperature—but you have to limit the temperature of the water to 170°F. Why? Because a single degree over and you might as well have just gotten the cooked shrimp at Costco for your shrimp cocktail (which isn't bad, don't get me wrong...it's just you wasted your time). Perfectly poached shrimp are luscious and incredibly tender and—also!—firm and snappy, and I can can eat them by the gross (the Costco stuff I can only eat by the handful, for comparison). But you don't just poach shrimp, do ya? What about chicken breasts? Do you not poach chicken breasts? Well the same method for poaching shrimp works for poaching chicken, but the key is to keep the water from going too far over 150°F. The result is incredibly juicy chicken that's ideal for salads, soups (with noodles à la Sohla, or otherwise), and even just on its own over a fragrant bowl of white rice. Thing is, it's impossible to achieve without a decent thermometer of some kind. The last argument I'm going to make for why an instant-read thermometer is necessary for poaching is the onsen egg. If you don't have a sous vide set up, and you don't have easy access to a Japanese hot spring, then the only way you'll ever get to eat one of these beautifully custard-like soft-cooked eggs is by babysitting a pot of water with an instant-read thermometer for exactly 13 minutes. In fact, when you do buy an instant-read thermometer, do the onsen egg first. It's worth the (relatively cheap, all things considered) purchase price. Temperature control is almost as crucial when frying things in pots of oil as it is when poaching stuff; the only difference is that the temperatures you're monitoring are far in excess of the 212°F you're limited by in a pot of water. One of the reasons why we recommend the ThermoWorks thermometers is that they can handle a wide range of temperatures. 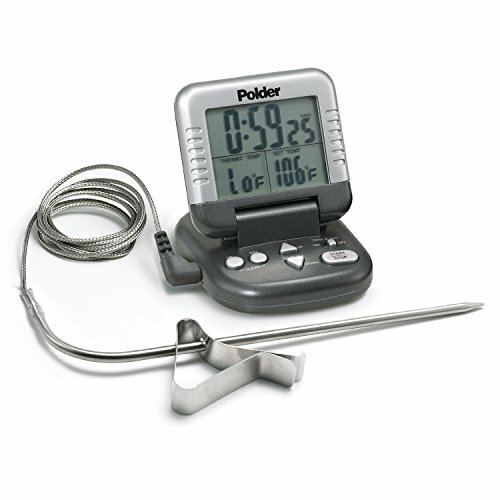 Stella, our pastry wizard, in fact prefers Polder's digital thermometer over the ThermoWorks ones, in part because it comes with a clip attachment that makes it perfect for constant monitoring of things like fry oil, while still being able to measure a similar range in temperatures. There's a whole bunch of things you'll want to stick a thermometer in if you spend any amount of time whipping up desserts in your kitchen. We've already covered frying cannoli shells, but being able to monitor the temperature of a custard helps to prevent ending up with scrambled eggs (as in Daniel's sleeper-hit Japanese buckwheat pudding), and it's also very important for ensuring that your cake batters bake up as airy and light as they should, and for getting the consistency of cream cheese frosting right. If you're ever wondering whether it's a little too hot or too cool in your kitchen and whether the ambient temperature might affect what you're baking, you're going to want to measure the temperature of your ingredients. And of course, we can't forget making caramel sauce. You can't eyeball 225°F! In short, please go out and buy a dang thermometer. It will make your food better, I promise!